National Sawdust has cancelled tonight's program. Will be rescheduled next season elsewhere. 10 months 6 days ago. Anthony Kershaw shared a link to David Del Tredici's timeline. 10 months 2 weeks ago. Beliavsky Produces Documentary on Composer David Del Tredici https://www.youtube.com/watch?v=SLvkPDcsQ5A 1 year 1 month ago. Hi David All the best from Patricia Morehead and Philip Morehead 1 year 2 months ago. David Del Tredici updated their profile picture. 1 year 2 months ago. At first blush there may not seem to be much of a connection between the worlds of Alice in Wonderland and Dracula. Geographically speaking they are as far apart as Oxford and Transylvania; Hormonally, there is no comparison. Even their beverages of choice—tea and blood respectively—celebrate different themes. Yet both legends deal with the curiosity of nineteenth century young virgins, and, pertinent to the present case, both have been set to music by the grandmaster of gothic Neo-Romanticism himself, David Del Tredici (b. 1937). In these settings for soprano-narrator and chamber orchestra he conducts the Cleveland Chamber Symphony with the emotionally charged Hila Plitmann as soloist. Vintage Alice–so named because it was commissioned by the Paul Masson Winery–dates from 1972 and is the fourth of his treatments of Lewis Carroll’s Alice books. It focuses on the Mad Hatter’s Tea Party scene and you will hear delicious parodies of God Save the Queen and Twinkle, Twinkle, Little Star, more chaotic than a room full of Suzuki students could ever achieve. Dracula is a setting of the poem by Alfred Corn, “My Neighbor, the Distinguished Count,” which tells the story from the point of view of the young woman next door. She goes through the usual stages of your typical romance: disinterest, gradual seduction, degradation, rejection, and vampiristic transformation. There are rich undertones to both these stories that make them suitable for audiences of all ages. Del Tredici has captured their innocence and experience both charmingly and creepily. The great attraction of David Del Tredici's music, for me, is its unabashed joyfulness. He obviously derives tremendous (and,more often than not, contagious) pleasure in manipulating simple, innocent tunes and demanding flamboyant virtuoso displays. The zany spirit of Carl Stalling, composer of so many classic cartoon scores, seems to hover over Vintage Alice recorded here. Del Tredici's musical evocation of the Mad Hatter's infamous tea party is a set of dueling variations on Twinkle, Twinkle, Little Star and God Save the Queen. The soprano soloist alternates between spoken narration and song, including impressive outbursts of vocal pyrotechnics. The effect is appropriately manic. Lucy Shelton recorded Vintage Alice with Oliver Knussen and the ASKO Ensemble for DG in 1994- a superb performance, though this one is even better. Hila Plitmann negotiates the coloratura writing with far greater ease, and her narration is more vividly characterized. In Dracula, a setting of Alfred Corn's neo-Victorian poem My Neighbor, the Distinguished Count, Del Tredici's music affectionately recalls old horror movie scores (down to the use of a wind machine and theremin. Again, the soprano speaks and sings, and again the vocal writing is deliciously over the top. This notable addition to Del Tredici's discography is warmly recommended. David Del Tredici (b. 1937) is an American serial-music-trained composer who left serial and minimalist idioms a long time ago for unbridled neo-Romantic forms; to many musicologist he is for the most part responsible for the resurgence of Romantic and Classic forms in symphonic and chamber music which we are presently witnessing. Other composers included in this rarified field are John Corigliano, Christopher Theofanides, Jennifer Higdon and Essa Peka Salonen just to name a few. 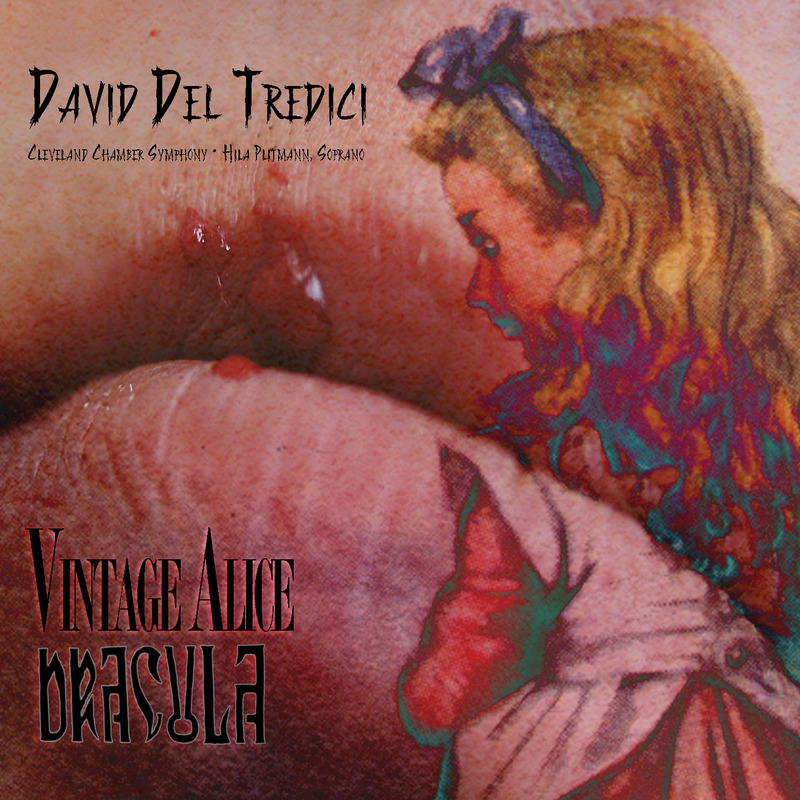 Del Tredici has composed at least ten major symphonic works to this date based on Lewis Carroll’s Alice’s Adventures in Wonderland and Vintage Alice (1972) is one of them, while Dracula (1999) represents a further transformation still within the neo-Romantic mold. Briefly, Del Tredici - while trained in serial techniques with some minimalist overtones - has been composing in a neo-Romantic idiom for a long time. On auditioning this disc I was struck by his urge to idealize sound (solo instruments and whole ensemble) to produce strong tonal melodies with highly chromatic orchestration and some hints of atonality at times, for very colorful music. His music seems to embrace unrestricted and unbounded individuality, overriding all dogmas for an overwhelmingly unorthodox musical style - one that exhibits a highly-charged personality and captivating emotional vitality. Although there has been obvious physical transformations in Del Tredici’s life to this date there is an unbroken musical and intellectual continuity in his works and the Alice series is the best example of all, full of expressive forces and soaring vocal lyricism with turbulent orchestral accompaniments. Vintage Alice and Dracula express and expand as well on musical ideas established in early periods, such as the Classical period of Mozart and Haydn, in the making of music which describes “action” through the expansion of formal structures within the composition itself, making the pieces more passionate and expressive than that of “pure music.” Del Tredici’s musical world acknowledges inescapable realities in the world (even if that is a fantasy world) which could only be reached through music that speaks of emotions, feelings and intuition that seeks to discover and arouse further emotions and feelings from the listeners with well timed dissonances and “cyclic” interludes. The best of all examples is his Child Alice (1980) - a symphony in operatic form. His musical idiom is firmly rooted on tonality and his harmonic vocabulary and contagious rhythms seek to fuse large structural harmonic planning with further chromatic innovations in order to achieve greater fluidity in the musical story and logical contrasts with an expanded harmonic language of previously unused chords, or innovative chord progressions and their precise harmonic function. His emphasis on tonal melody is facilitated by the extensive use of cyclic forms from serial music and unifying devices such as those found in minimalism. While in the pursuit of style Del Tredici has discovered “his” own elements of rhythm, melody and modality that give his music a distinctive character by avoiding the use of any major and/or minor home keys - Vintage Alice has none throughout its 629-bars-long score. A trademark of Del Tredici is his use of harmonic ambiguity and the technique of moving rapidly between different keys for a seemingly “harmonic chaos” (not really) avoiding establishing a “home” key at all with the striking effect of producing tension between the musical structure and the emotional expression of the sounds. The result is symphonic music characterized by the expression of emotions emphasized by lyrical, songlike melodies, adventurous modulations, and chromatic harmonies with striking use of discords. While the music is denser at times with heavy musical textures that exhibit bold dramatic contrasts he also explores wide ranges of pitch, dynamics and tone colors. The latter applies mostly to Vintage Alice while Dracula is mostly tonally-centered chromatic music with extremely colorful orchestration. Dracula is a musical rendition based on Alfred Corn’s poem, My Neighbor, the Distinguished Count; basically it is a music-drama of the giocoso kind – an operetta? It is scored for amplified soprano voice (Hila Plitman – with a tremendous three octaves range) and thirteen instrumental players including the use of a theremin, an electronic instrument once rather widely used in Hollywood film scores. Dracula shows the more than twenty years of Del Tredici’s musical/literary transformations still within neo-Romantic music idioms. Vintage Alice’s music is funny while Dracula’s is scary, but funny as well thanks to the many scored percussion effects that make for a lusciously frightening music-drama, rendered just as Vintage Alice - with finesse and unbounded energy by the Cleveland Chamber Symphony and Del Tredici himself turned conductor for this occasion. As far as the sound is concerned this disc with what could have been a knockout in SACD format here within the limits imposed by the 16/44.1 CD format shows all the limitations that sound compression is known for and rends the extreme dynamics of these two symphonic pieces in barely acceptable sound – it might be good enough within the confines of a car but not enough for a good home sound system. Also, remember this disc is less than 48 minutes long. Final words: if one is not that conservative in musical terms Del Tredici’s music is there to prove that new tonal acoustic music is well and alive - we already knew him to be one of the major musical and intellectual forces of our time. I highly recommended this disc (even as short as it is) as well as all others in Del Tredici’s Alice series; this composer is a must for all who love modern music! Pulitzer Prize winner David Del Tredici having tired of setting poems by Joyce, spent nearly 20 years with Martin Gardner's annotated "Alice in Wonderland", fearful his compositions would be subjected to ridicule. "Vintage Alice" is a "fantascene" on the Mad Hatter's Tea Party. THe neo-romantic music uses accordion, banjo and mandolin to create the whimsy of the scene. 'God Save the Queen' and 'Twinkle, Twinkle Little Star' are submitted to speed distortions, mimicking the antics of the Mad Hatter. "Dracula", a diabolical 20 minute setting of Alfred Corn's poem "My Neighbor, The Distinguished Count", steals the show. There are high demands on the soprano, who speaks more than sings and traverses several octaves, because she must voice the count below middle C and wail in terror above high C. The Count's entrance is marked by the inclusion of the theremin-both cliche since it was never treated as a legitimate instrument, and fitting with the rest of the music. Hila Plitmann deftly manages the evolving, and sometimes extreme emotions of the woman living next to the depraved Count. Slowly seduced over the course of the work, she finally chooses a life as a member of the undead.